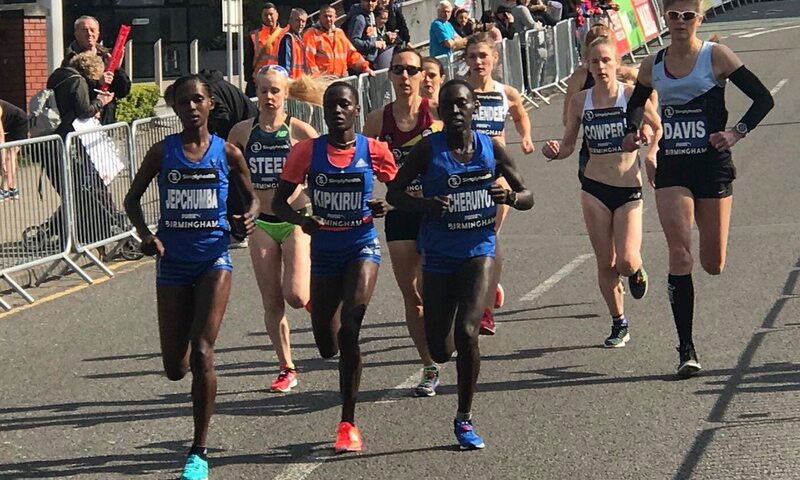 Caroline Kipkirui confirmed her superb pacing job for Mary Keitany in the Virgin Money London Marathon was no flash in the pan as she blazed to a superb 30:45 PB to win the Simplyhealth Great Birmingham 10k. Just seven days after her half-marathon in London, the Kenyan won on a far from flat Birmingham course in very windy conditions. The class of her victory is illustrated by the fact she finished 12 seconds clear of Violah Jepchumba, who recently bettered the world 10km record with a time of 30:05 during the Prague Half Marathon. The early pace from the Kenyans was remarkable and they blazed the opening downhill kilometre inside 2:50. Halfway was reached just outside 15 minutes but the wind and slightly tougher second half scuppered any records. It was still one of the fastest women’s 10km races in history. Kipkirui proved the strongest and it was a Kenyan clean-sweep with Lucy Cheruiyot an isolated third in 32:17. Over a minute back, recent Brighton 10km winner Katrina Wootton continued her good form with a 33:31 for fourth. Both her and the next finisher Gemma Steel, the former European cross-country champion, who was fifth in 34:43, found it tough going alone in the strong winds and after starting fast in chasing the Kenyans. The men’s race started much slower but the closing pace was much faster on the tougher second half. Frankline Keitany, who was second in the Kenyan Defence Forces Cross Country Championships, made a great European debut. In an exciting finish, he won after a sprint in a time of 28:41, just a second up on the better-known Timothy Toroitich of Uganda who was an Olympic 10,000m finalist and fifth in the 2013 World Championships. The leading Briton was Matt Clowes who thought he had done enough to break 30 minutes with a late sprint but he was officially given 30:00 which was good running in the windy conditions and a solo second half. Richard Goodman finished fourth just five seconds up on Daniel Cliff in a time of 30:28. Liz McColgan-Nuttall ran in the mass race and the now W50 ran around 40 minutes, with the former world champion later congratulated by fellow Olympic medalists Brendan Foster and Ian Stewart. The 1991 world gold medallist is running in the Stirling Scottish Marathon in a few weeks. One of the most impressive performances in the race was Alistair Rutherford, dressed as a viola, who ran 36 minutes.